Thinking about building a new home? New construction on choice pieces of land fit the bill nicely in Pughsville. 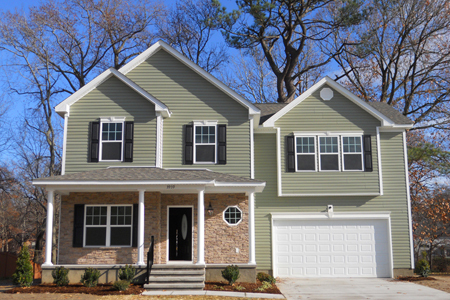 This family-friendly neighborhood of Hampton Roads is lined with affordable dollhouses. Directly south of Bon Secours Health Center at Harbour View and northwest of Chesapeake Square Mall, this community is located in Suffolk, VA. Residents will find getting to city amenities is not a problem with the close proximity of Interstate-664. Military bases like Norfolk Naval Shipyard, Naval Medical Center Portsmouth and Coast Guard Base Portsmouth are within minutes as well. Building a new home can entail quite a bit of work so homebuyers want to make sure their minds are made up before jumping in. There is ample land out here so choosing just the right home site should not be a problem. Waiting for that home to be built may seem a bit daunting to some folks so they may go with a new construction house. A new home in Pughsville may come with stainless steel appliances, kitchen pantry, ceramic tile flooring, cathedral ceiling, kitchen island, hardwood flooring, built-in shelving, dual-zone heating and cooling system, security system, two-car garage, porch, gas fireplace and more. Considering the possibility of building a new home in Suffolk can be a weighty decision- but only until you learn more about the area. This little section of Virginia is a flurry of activity yet secluded enough to get away from the city noise. Those who live in these new construction homes can walk to the Pughsville Park and let the kids play outside. Several churches are also within walking distance. There is an AMF Western Branch Lanes just down the road to bowl when the mood strikes. Get a tasty bite to eat at nearby Taylor Road Plaza where patrons can choose from Spaghetti Eddie’s Pizza Cafe, La Tolteca and Number One Chinese Restaurant. Bennett’s Creek Park is close by and offers fun activities in a land of natural beauty. Whether you’ve decided to begin building a new home or purchase a new construction home, Pughsville is the place to look. To land in a safe neighborhood with friendly people is no accident; it takes planning. So plan on giving this community a thorough look. 5 bed. 2 bath. 2,620 sqft. 3 bed. 2 bath. 1,800 sqft. 4 bed. 2 bath. 2,267 sqft. 3 bed. 2 bath. 1,868 sqft. Did you find your future home?